The Path To Clean Digestion? The end of the semester is nigh! You can tell that I’ve been busy because I haven’t posted here since February(!! ); where did the time go?! Oh, right, I was doing two internships and taking an intensive writing & reporting class. What is life?? This past month, I’ve almost lost my mind from stress a few times, and sleep deprivation has been high. There were a few weeks where I wrangled my diet into shape (salads for lunch, brown rice + vegetables for dinner) — I even started going to the gym again! — but the rest of the time was filled with Pommes Frites and ice cream, thus my body has not been feeling its best. Getting a massage helped, but I’ve still been fatigued and irritable, and my skin is not happy. An article I recently read in Marie Claire has been stuck in my mind. 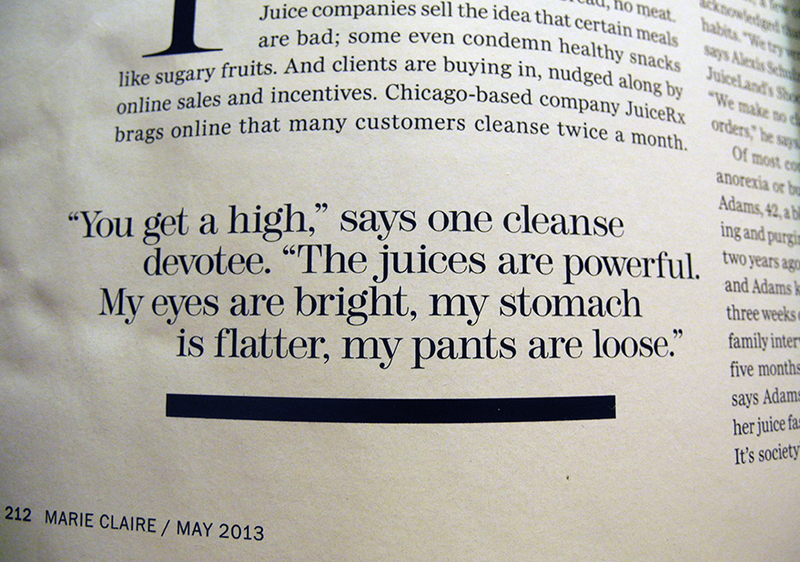 The piece was about the dangers of becoming addicted to juice cleanses, which, you know, first world problem, but apparently these cleanses augment the potential for eating disorders in an easy-to-disguise way. When you highlight a fad with that kind of pull quote, it’s going to sound like the best thing ever, no matter how perilous you forewarn it to be. So after obsessing about it for a week, I’ve decided to try a three-day cleanse at the beginning of May before going home for the month. Does it seem like I’m just jumping aboard a trend? Sure, this movement is just gaining traction in the U.S., but detoxing is de rigueur at many of the spa retreats we covered in AsiaSpa Magazine, so it doesn’t seem like such a crazy concept to me. I’m no stranger to the occasional fast, so I figure it won’t be too difficult. What’s the harm (apart from a serious dent in my bank account)? It’s a quick fix with all the necessary vitamins! Juice cleanses are unsurprisingly expensive; as a beginner, my criteria is simply to find the cheapest one that’s liquid-only (no additional salads or puddings or whatnot) and locally made, so I can pick it up instead of playing tag with the delivery person. All this talk makes me miss China, where you can pick up a freshly pressed juice on the street for $1! § 2 Responses to The Path To Clean Digestion? You are currently reading The Path To Clean Digestion? at auradis.